Absolutely beautiful! Could you please tell me the style of cabinet in this photo (with the hour glass shape) and who is the company that made them? I Agree gorgeous kitchen! Can you tell me the company that created these cutsom cabinets? I love the design and the finish (is that a pewter glaze?) Thank you! I couldn't find the answer to the question regarding the walls - paint color? Thanks! The walls are so beautiful. They almost seem to glow. When I first saw the picture I thought someone had silver-leafed the walls. 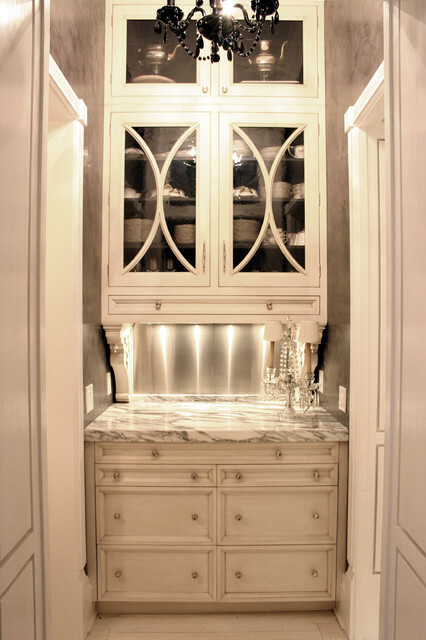 Another fun idea for a pantry backsplash is a glass mirror cut to fit the back area under the cabinet. I'm interested in the same info. I know 15-18" is standard but this looks like it might be less? Is it just an optical illusion? Looks fantastic. 18" is standard height distance between countertop and upper cabinets. Upper cabinets need to be set 54" above the floor. Could you please tell me the width and depth of the drawers? - I noticed the very slim upper drawer under the glass doors and the three slim drawers under the counter top. How deep are each of these drawers? and how would they be utilized? Thanks so much. Since this is a butler's pantry - they would be used for flatware, cutlery, and other utensils. what color is the venetian plaster? Just incredible, Rebekah. Are those low profile under cabinet LED lights that accentuate the SS backsplash? Just wrote to say how impressed I am with the light pattern on the SS backsplash. I'm pinning this on a wishlist for my dream kitchen. I live in Chicago metro. Do you work for a kitchen company or yourself? Is that paint, wallpaper, or a finish on those walls? Beautiful! Deminsions - What is the width of this Cabinet unit?? Love the cabinets! - Where are they from and finish? Butler Pantry Corbels - I'm interested in knowing where these corbels are from. Please email if you wouldn't mind. Thank you!! Where are the corbels from? Do you have a company name? Cabinet color - Can you tell me what color is on the cabinets? Base and ? We are painting our kitchen with Benjamin Moore Revere Pewter and would like to paint cabinets a creamy color. Also, what trim color do you suggest? Thank you! The Lincoln Park kitchen just takes my breath away - every detail seems to have been wonderfully thought out - Can you tell me what type of under cabinet lighting makes such an interesting reflection on the stainless backsplash? what floor is used in servery? what is used on floors in this butlers pantry area? How wide is this pantry? This elegant butler's pantry is the perfect place to set up the bar. 3. Stainless steel. In small doses, full-height stainless can work great in residential design. Most people don't love the look of stainless everywhere; it's often too institutional looking. But in small sections or mixed in with other materials it works well. 1. Small and shiny. If you have a smaller butler's pantry, elevate the look of your area with undercabinet lighting and a sheet of stainless steel for your backsplash to get a high-polish shine. "A little bit of bling, tempered with a bit of industrial edginess on a traditional base, is also something Chicagoans seem to be more open to these days," Zaveloff says. "Most of my clients aren’t looking for safe and transitional; they’re looking for something that expresses who they are or who they want to be." Butler's Pantry at Sage Thrasher.